Independent ; Short-Tempered ; Fierce. Stand up stand up, what are you waiting for. This is everything you wanted. Get up listen up, I got something to say. Age ;; 4½ years old. 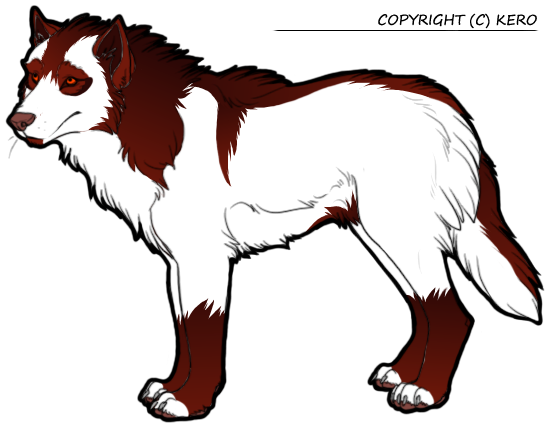 Description ;; Aries is a large, muscular male, with narrow fire coloured eyes, and long, spiky snow tinted fur. Auburn and ginger markings stain his coat. His paw-pads and nose are a light tan. Physical problems ;; Due to an injury in the past, Aries has problems with his front right leg. The leg will often go weak, and he walks with a limp. Wanted rank ;; Koa. I believe that is the warrior rank? Rank;; Currently he has no rank. Off-spring;; None that he knows of. Here’s your chance to form your legacy. Here’s your chance to engrave your memory. This is what you’ve been dreaming of. Take a breath, close your eyes and dive in. From the beginning we are destined for a higher cause. Our minds expanded how we planned it then we wrote the laws. Now it’s come to a decision and we’re drawing straws. Stand up stand up, it’s what you’re waiting for. This is everything you wanted. There is nothing more. theme song;; Stand Up by Exotype. I found LotW by ;; Looking for Wolf RPs.